If you’re in the position of being able to choose your flooring, you might be wondering what the best flooring for your pets is. After all, dogs are like a part of the family. We want them to be comfortable and have the best life possible. And part of that is having the best flooring to run around on, play on, and sleep on. Here’s an overall of the different types of flooring and how well they work for pets. Many homes feature carpets because they are comfortable, soft, and affordable. Many people consider carpets a good option for pets because they are a plush surface for them to lounge on. However, pet claws often catch carpet fibers, tearing them up and causing snags. The carpet fibers also tend to hold onto pet fur, which can be hard to remove. However, a good carpet cleaner can help you remove trapped pet hairs, so it’s not a big deal if you can commit to regular maintenance. Hardwood is a beautiful flooring choice that has become very popular recently. However, it’s a relatively soft flooring option, meaning that it is easily scratched by pet claws running around. And, if your dog is prone to having accidents, hardwood is a bad option. It tends to absorb moisture and odors, so urine accidents in hardwood floors are almost impossible to remove. Tile is a fairly affordable flooring option. Tile comes in many colors and shapes, so it’s more versatile than homeowners often believe. Tile is easy to clean if your pet is prone to shedding, and it’s usually water-resistant so it won’t absorb pet urine or odors. Tile does require regular cleaning to remain mold- and bacteria-free, but a professional tile cleaner can help. The biggest downside of tile for pets is that it is cold and uncomfortable to lay on. A pet bed is a great way to add some comfort to a hard tile floor. Stone floors are another option comparable to tile. They are often a little more expensive, but they are also often considered more upscale. Softer stones such as marble require upkeep to look great, but harder stones are a great low maintenance option for pets. They are easy to clean if pets have an accident or shed a lot of fur. You can use a pet bed and rugs to make stone floors more comfortable as with tile flooring. 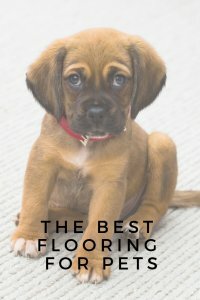 It’s very subjective what the best flooring type for your home is, but hopefully this guide has helped you to learn more about the advantages of each type of flooring when pets are involved.